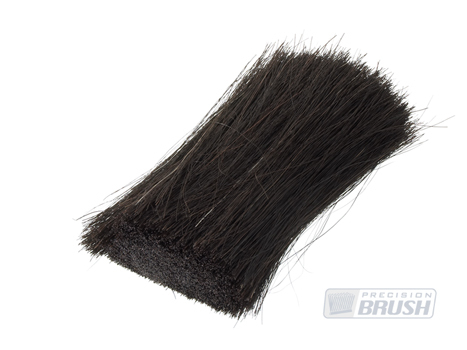 Precision Brush Company stocks filaments in a large range of materials and sizes. Choosing the filament size or diameter of the filament in conjunction with the filament length will determine the stiffness of the filament. 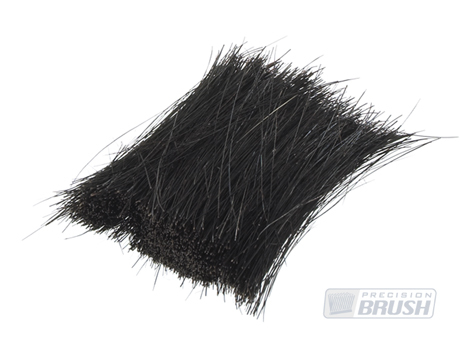 Here are a few examples of common commercial brushes and the diameter of the filaments used in them. Most synthetic filaments are available in either crimped or straight filaments. The crimped filaments have a wave in the filament and level filaments are straight. 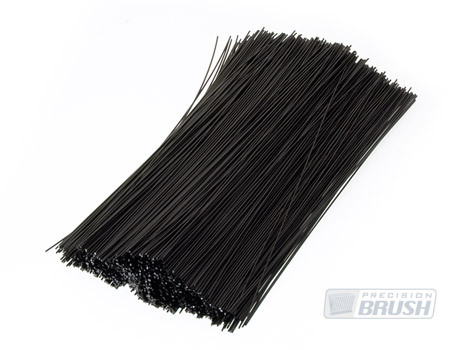 Although approximately the same number of filaments can be installed in the brush the crimped filaments flair out more at the bristle tips giving the impression of a more densely filled brush. 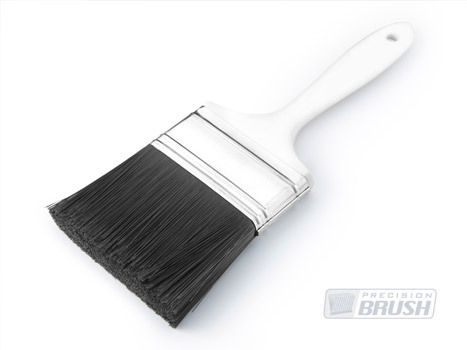 This is important for certain applications, especially in cylinder brushes where a smooth brush face is required. Level filaments tend to group together more and are better suited for brush seal applications. Although many custom color filaments are available, black and natural are the most common. Natural color filaments are made without any color additives. The filament appears to be white, but is actually clear and can sometimes appear slightly off-white. If a true white is required for an application we recommend using a white filament rather than natural color. Nylon is a generic designation for a family of synthetic polymers known as polyamides Nylon is essentially an organic thermoplastic (a synthetic polymeric resin) originally developed by DuPont that is very durable, easy to machine and can handle very high temperatures. Polyimide is also highly insulative and does not contaminate its surroundings (does not out-gas). It is the toughest and most durable synthetic filament available. 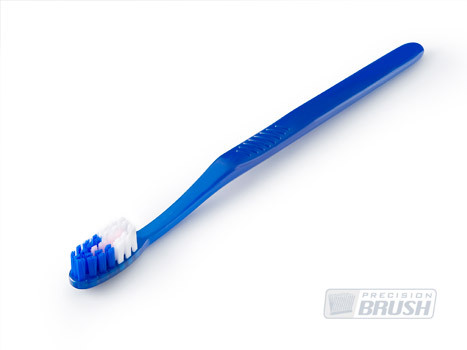 Nylon bristles discourage bacterial growth and resist most acids. It is non-shedding, and is excellent for cleaning and scrubbing applications with its strong abrasion resistance properties. It does not scratch most surfaces. Nylon is a versatile synthetic fiber, manufactured mainly in the United States. Nylon has a high degree of durability, is resistant to most common chemicals and has excellent bend recovery. Three grades of nylon are available: Type 6, Type 6.6, and Type 6.12. The wear ability is similar between all three, however the higher the grade the less moisture it will absorb. Precision Brush Company stocks nylon filament in black or natural (clear or slightly white) in diameters ranging from .003" to .050". Crimped and/or level filaments are available. Polypropylene is a popular synthetic filament used in a wide variety of applications. Like nylon, it is mainly manufactured in the United States. Its low specific gravity offers a low cost high performance fiber for wet or dry applications. Polypropylene has excellent stiffness when wet, is non-brittle, is inert to most solvents, oils, acids and chemicals, and is fungus resistant. The polypropylene, which we stock, is black or natural in color and .006" to .060" in diameter. Crimped and level filaments are available. Tampico is a vegetable fiber obtained from the leaves of the agava lechuguilla plant, which grows in Mexico. The color is creamy white (slightly yellow) but can be dyed, usually dark gray. Tampico can be used either wet or dry. Its high absorbency rate makes it suitable for low abrasion scrubbing and washing applications. It is also heat, alkali and acid resistant. 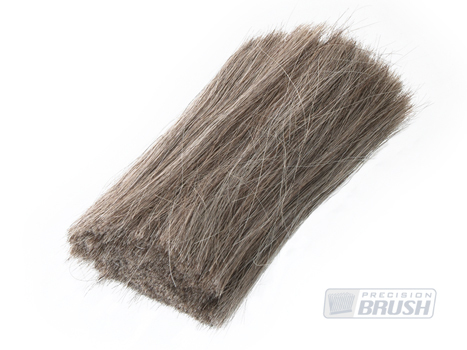 Horse hair is soft, resilient and long lasting. 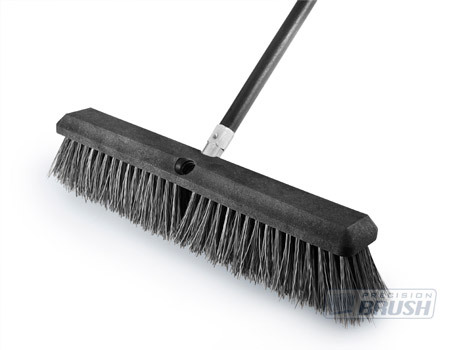 Excellent for sweeping polished surfaces, Horse Hair works well for dusting, flux removal and general cleanup. It is non-conductive. The hair is collected and processed in the United States, Canada, Argentina and China. The value of the hair is determined by the length and stiffness, with the price increasing as the length and relative stiffness increase. 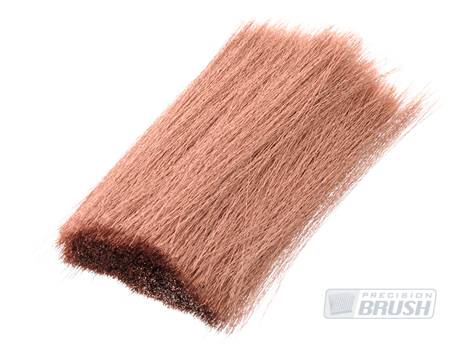 The color is usually a brownish-black mix and is comparatively soft to slightly stiff depending on bristle length. Horsehair should be used dry for polishing, scratch free cleaning or sweeping, or in higher temperature applications (375 degrees max.). Goat Hair is a very soft yet fine natural material with properties that make it excellent for use in fine polishing and cleaning. It is non-conductive. 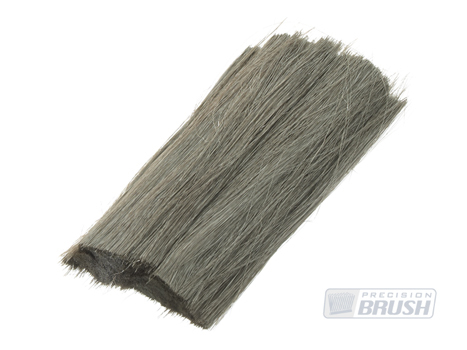 Hog bristle, also known as Chung King, is resilient and is the stiffest natural material available. 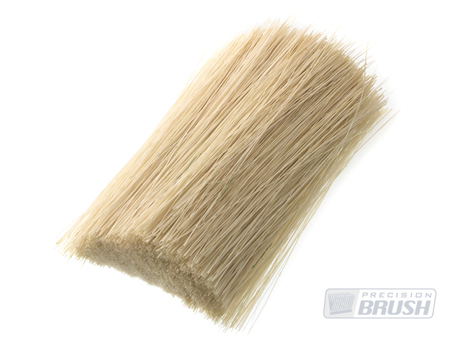 A Hog Bristle brush will provide the best possible cleaning. It works well when dealing with sticky, crusty materials or viscous fluids. It is non-conductive. Nylon Anti-static filling eliminates the problem of static electricity in many applications by providing a rapid dissipation of static charge faster than standard nylon filaments. Studies have shown that the ability of materials to dissipate charge generated on their own surface by contact or sliding actions is well matched by the decay of charge deposited from a high voltage corona discharge. Nylon-AS eliminates the problems generated by static electricity in many applications by providing a rapid dissipation of static charge. Conductive materials have to be grounded in order to dissipate charges. Antistatic materials inhibit the generation of static charges. Static decay is the time required for a sample to dissipate a percentage (90-99%) of an initial charge of 5 KV (both positive and negative). A charge is induced on the sample by contact with electrodes, and is then grounded. An electronic voltmeter makes electrostatic (non-contact) measurement of the charge on the sample. Conductive Nylon is a type 6.6 nylon with an electrically conductive carbon suffused onto the surface. 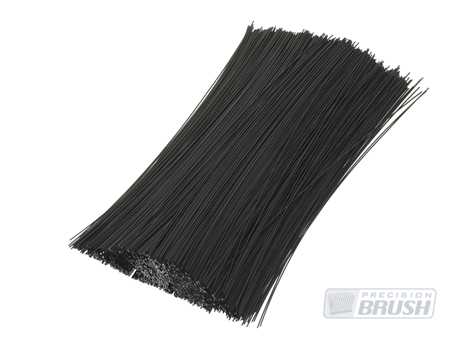 The filaments have a round cross section and have a coating thickness of approximately 1 micron. Conductive Nylon is available in 0.254 mm (.010"), 0.41 mm (.016") and 0.52 mm (.020") diameters. The conductivity is affected by humidity and is unaffected by solvents, except strong acids. It is suitable for uses up to 230 degrees (F) and will not crack off during flexing. The coating will wear off at about the same rate as the rest of the fiber. Thunderon® is a fiber that has been chemically bonded with a layer of copper sulfide. When this fine (.0015" diameter) conductive fiber nears the surface of static charged material, it will ionize the air, which acts as a carrier of electrons away from the charged material. 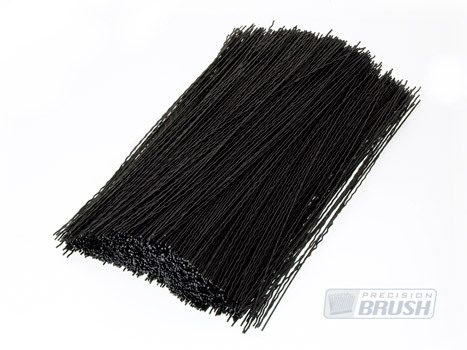 The bristle material has the bend recovery and resilience associated with acrylic fiber. 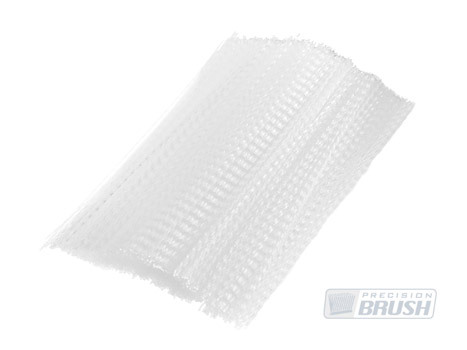 It can be mixed with Goat Hair or other materials to add stiffness without diminishing effects. This outer layer becomes a part of the host fiber itself, which precludes the 'flaking' problem experienced by other conductive fibers. The fiber diameter is as fine as .004 cm and its conductive layer is as thin as 300~1,000. It has electrical specific resistance of 10-1-10-2"
Brass is a softer wire than stainless steel. This brass wire is 70% Copper and 30% Zinc. 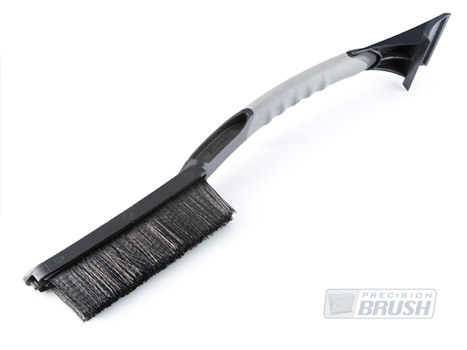 Precision Brush only uses the highest quality brass, which is highly conductive and corrosion resistant. 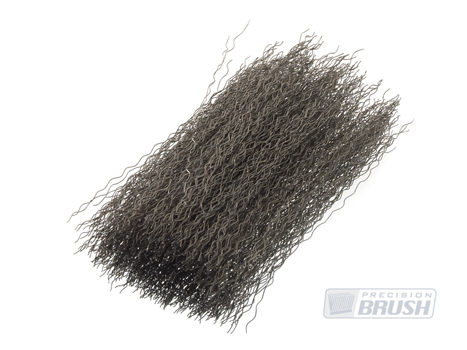 This wire is used in the manufacture of all brass brushes Uses that include burnishing, polishing, non-sparking static removal and some de-burring or material removal. This wire is 95% Copper and 5% Tin. The addition of tin to copper effectively increases the fatigue strength. Phosphor Bronze is corrosion resistant, has good fatigue life, and has high electric conductivity, low elastic modulus and high tensile strength. High Carbon Steel is the hardest of the commonly offered brush wires, providing a high fatigue life and durable cutting action. It is most appropriate for work on steel and iron work pieces, but may also be used on wood, aluminum, brass and copper. Weld cleaning, deburring, rust and oxide removal, surface preparation, and surface finishing are common applications. Stainless Steel is a highly corrosion-resistant wire to be used where contamination or rust is a problem. Fine wires .003" diameter, is excellent for burnishing without removing the base material. Stainless Steel is used to prevent harmful ferrous deposits on brushed parts. It is non-shedding.